Reposted from the Daily Herald, by Caroline Linden. Given the choice of eating breakfast or dinner out, I would choose brunch hands-down. Maybe it’s the fact that I love the sweet (fresh fruit, I’m looking at you). Or it’s the rarity of going out to eat in the morning — busy schedules often don’t lend themselves to lingering over another cup of coffee at home. So, I was happy to see the seventh iteration of Elly’s Pancake House move into the former Mimi’s Cafe near the Naperville Crossings shops just west of Route 59 in southwest Naperville. I called ahead on New Year’s morning to see if our party of four needed a reservation. I was told that we could get seated right away. But, alas, when we arrived, the friendly hostess informed us the wait was already up to 25 minutes. We decided to stick it out because of the enticing menu. The packed lobby, while spacious, could use more benches or chairs for those waiting on busy mornings. If you’re in need of a pick-me-up right away, on the left side of the waiting area there’s a coffee and juice bar serving specialty espressos, cold brews, lattes, hot teas, house-made juices and smoothies (the Green Goodness — pineapple, spinach, banana and orange juice — looked refreshing). While waiting, we perused the extensive menu, and got a laugh from the silly joke written on the oversized chalkboard at the back of the lobby that also touts the day’s specials. Once we were seated in a cushy booth in the bright white dining room, our waitress brought over coffee in greeting. Yes, please. (A minor quibble: No Splenda.) The pulpy orange juice was a refreshing quencher. 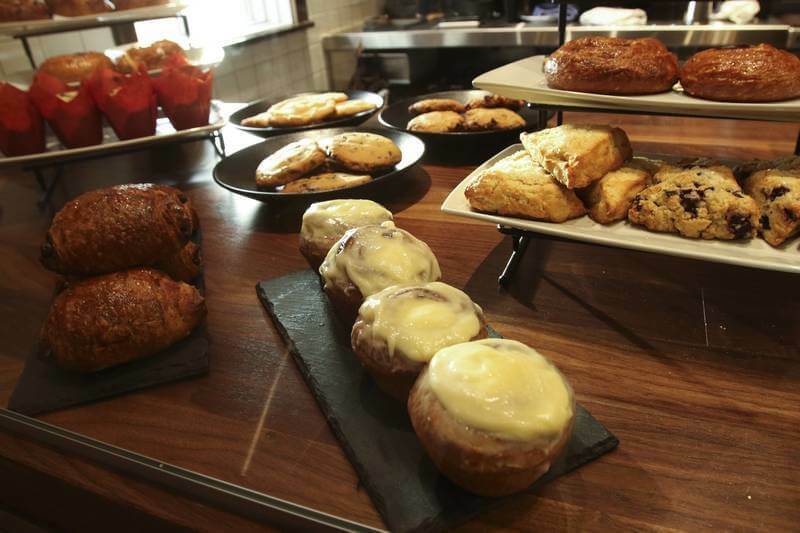 With brunch, the question is always savory or sweet. 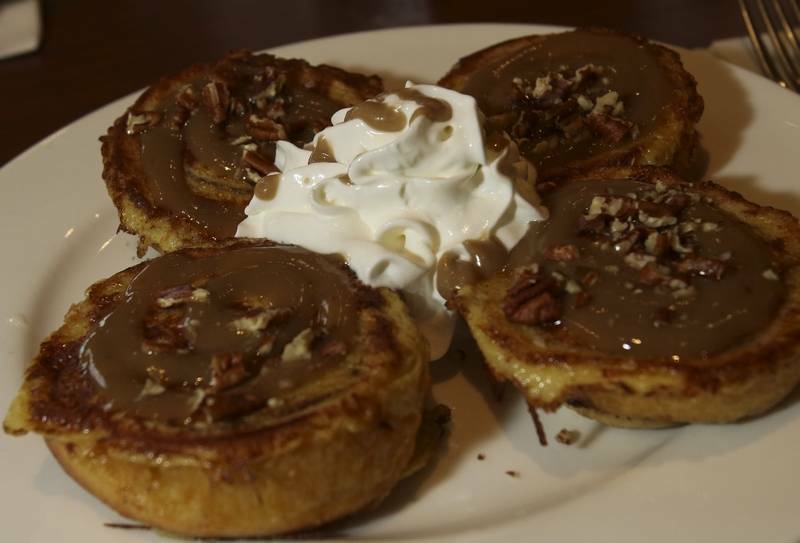 On the sweet side, choices range from specialty baked pancakes such as the baked apple pancakes (seriously considered this) to apple cinnamon chip pancakes to sticky bun French toast to stuffed berry mascarpone crepes to the bacon waffle (with caramelized bacon bits mixed in). Gluten-free pancakes are on offer, too. Savory dishes include huevos rancheros, the southwest omelette (applewood bacon, avocado, onions, tomato and lots of fresh jalapeño peppers that will have you reaching for your water), the veggie skillet, benedicts and morning sandwiches. And that’s just the breakfast side. There’s a whole section of salads (kale and fennel Caesar), bowls (quinoa salmon) and sandwiches (falafel burger, Reuben, Monte Cristo) that will have to wait until next time. We went for both savory and sweet. If banana-Nutella is a favorite, as it is for one member of our party, diners can get the combination via pancakes, brioche French toast, crepes or Belgian waffles. Caramelized bananas, Nutella and crushed hazelnuts topped the crispy, delicious waffle. It was polished off in no time. The Oreo pancakes, with crushed cookies mixed in the batter, were fluffy and not overly sweet. Luckily, the pancakes were only garnished with crushed Oreos and powdered sugar. If you want to add more sweet, pure maple syrup comes on the side. The Number 7 morning sandwich — a croissant topped with a fried egg, ham and sharp cheddar — was a bit too buttery. But the flavors still meshed well. After going back and forth on what to order, I finally decided on the Latina omelette. Filled with black beans, tomato, onions and queso fresco, the football-shaped omelette drew freshness from the cilantro. The chipotle drizzle added quite a quick. Substituting fresh fruit (cantaloupe, honeydew, watermelon — slightly out of season, not surprising at this time of year) for the hash browns wasn’t an issue. I would order this dish again. Given how busy the restaurant was, we were impressed with the service. Our waitress was efficient while still being personable and checking in often. And we were surprised at how fast our meals were delivered to the table. We weren’t offered refills on our coffee, but that was a small oversight. 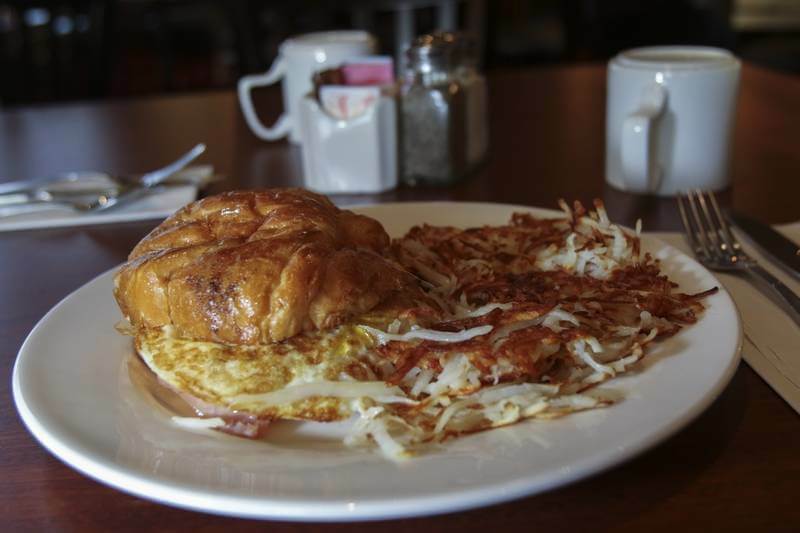 I’m already looking forward to a return visit so I can try the German pancakes or the chicken and waffle or the morning sunrise omelette … decisions for another time. Reposted from the Chicago Tribune, by Ruth Bohan. Fresh strawberry pancakes, cinnamon apple pancakes, blueberry pancakes, walnut raisin pancakes, chocolate chip pancakes, even plain old-fashioned pancakes and syrup. Elly’s Pancake House in Mundelein has them all. And the list of crepes and waffles and blintzes and French toast is almost as long as the pancake selection. “Fresh fruit is our thing,” said Chris Georges, who owns Elly’s with brother John and George Grekousis. Melons, kiwis, pineapple and more can be found in toppings or on the salad plates that are also available. But it is the wall of fresh oranges shining behind the cash register, where the customer can watch them being squeezed, that proves just how fresh the fruit really is. The juice is their specialty. Elly’s (named after Grekousis’ mother, because the men thought it sounded good and would be easy to remember) is the sixth restaurant to reside at this location in the last 15 years, but Chris Georges believes it will continue to be successful because it fills a need in the rapidly growing area of Mundelein and nearby Vernon Hills. Already there are regulars who stop in three or four times a week for breakfast, plus a group of retired teachers who meet on Mondays. Daily customers are not restricted to singles hurrying to work but include empty-nesters, families with lots of kids and, of course, travelers staying in nearby hotels who want to get an early morning start. The decor has been changed completely, with tables and booths in a handsome dark wood, further enhanced with a lot of greenery. Breakfast prices range from about $2.50 to $5.50 and lunch prices are $4 to $6. The large menu includes omelettes, cereals, soup, salads and burgers. The complete menu is available all day for patrons who might want a hamburger for breakfast or hot oatmeal for lunch.